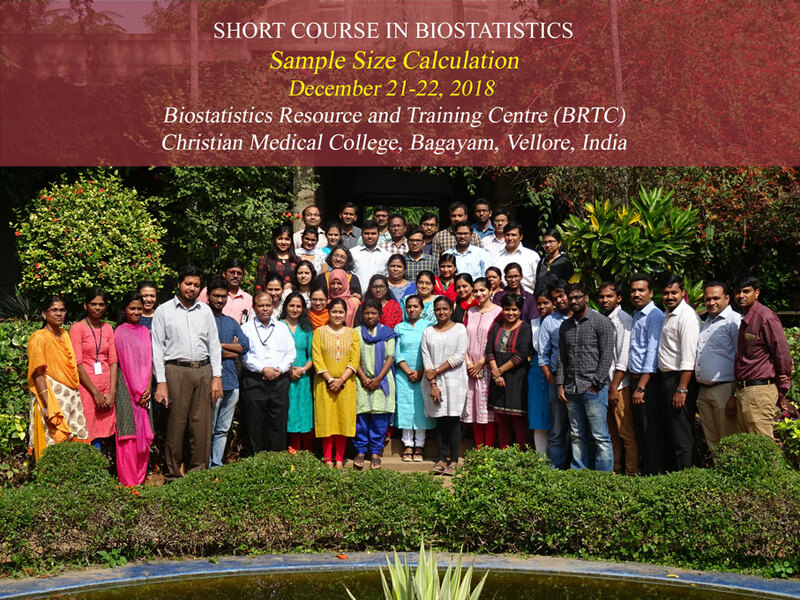 This course is intended to train people to Calculate Sample Size required in different research areas, in a simpler manner to researchers who are in need. The idea of this training program is to introduce a number of basic concepts and techniques that should allow the participants to get started with Sample Size. This course is also planned to introduce the software nMaster 2.0 which has been self developed by us. This software has been developed with all necessary formulae. The Sample size Practicals will be carried out using this software. The course is targeted towards researchers of varied profession such as biostatistics, medicine, public health, life science, social science, nursing, epidemiology etc., The participants should have basic knowledge in computers. Course Fee should be paid in full by December 14, 2018. Necessity for Sample Size, Basics concepts like alpha error, beta error, Power, Effect size, Confidence Intervals, One sided or two sided test, Equivalence or Non inferiority Margin, Dropouts will be introduced.